Chiles and cumin combine here to create the olfactory essence of the Border. Most any type of small chile pepper that you can get in the bottle will work. Be sure to taste it often and remove the chiles when it reaches the desired heat--the longer the chiles are left in, the hotter the liquor will get! Place the chiles and cumin in the vodka and let them steep for a week or more. 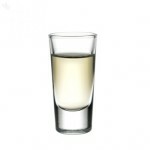 Periodically taste the liquor and remove the chiles when the desired heat has been obtained. Serve extremely cold, over ice, or in tomato juice for an “instant” Bloody Mary or Maria. Flavored liquors are often prepared in the Southwest with sliced jalapeños.